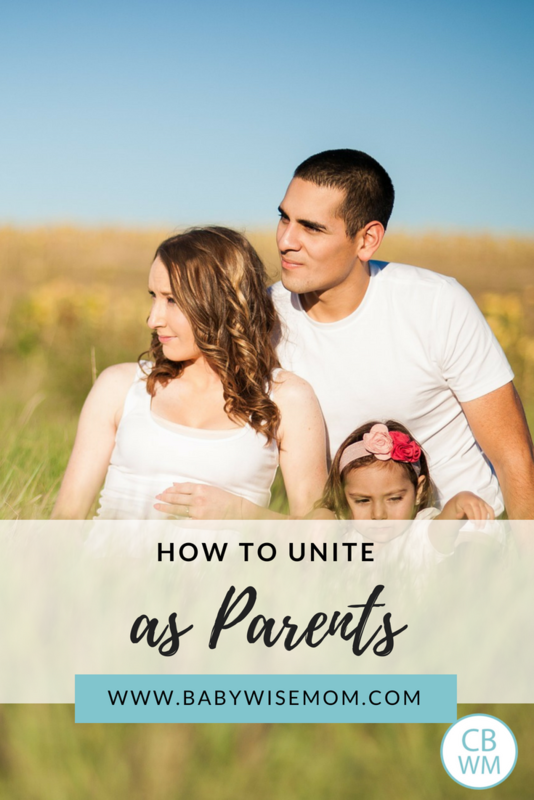 How to Unite as Parents and why you should. Uniting as parents helps keep your marriage strong. After my son was born, I was quite frustrated with my husband. I had this vision in my head of what he would be like as a father based on what I knew about him. I pictured him just wanting to hold his son all day when he got home from work and smiling at him. In retrospect, I think I was envisioning what a mother typically does rather than what a father does. My vision did not come to fruition. Instead of coming home and holding his son, he kept leaving the house to run errands. I worried he didn’t like our son. I thought he was looking for excuses to leave the house. I was just aching for some adult conversation and frankly a break from the baby. When I finally talked to him about it, we realized that we were on totally different pages. My husband was trying to figure out what he could do to contribute; he felt helpless and didn’t want to overstep his bounds. He thought I would be upset if he tried to take over baby duties. He knew errands needed to be taken care of, so he did them. My husband shows his love through acts of service, so he was frantically looking for things to do to serve his little family. I don’t know about the rest of you, but have found that I can easily get irritated with my husband shortly after a baby is born. I have friends that I know are the same way, so I at least know I am not totally alone. Your emotions are all over the place, you aren’t getting the sleep you should, you are trying to figure this new baby and new routine out, and your husband isn’t acting the way you envisioned him before the baby was born. Communication is the key. If you can be open and honest with your husband and say “When you do this, I feel this way.” I would talk to your husband about what you are seeing and how you are interpreting it. Chances are his motivations are very different from how you are viewing them. We often apply meaning to actions base on ourselves. We decide what something means based on what it would mean if we did it, rather than if the other person is doing it. If I left the house every day with a newborn at home, it would be because I was trying to get away and didn’t really like the new situation, just like I assumed were the feelings of my husband. But for him, it meant he loved us and wanted to do whatever he could to help out. He took care of the needs he could identify. Be honest with your spouse and with yourself. I now know that I am, um, harder to please in my postpartum weeks. I am normally a very level-headed, logical person. In those postpartum weeks, however, my emotional self starts to overpower my logical self. I have to tap into my logical self and tell myself to snap out of it. Understand that people have different viewpoints, different motivation, and different methods to express love. So that kind of covers your initial post partum time. There is another important step to take, and that is uniting with each other in purpose. It seems most parents have the same goal and are both on board to follow Babywise principles. 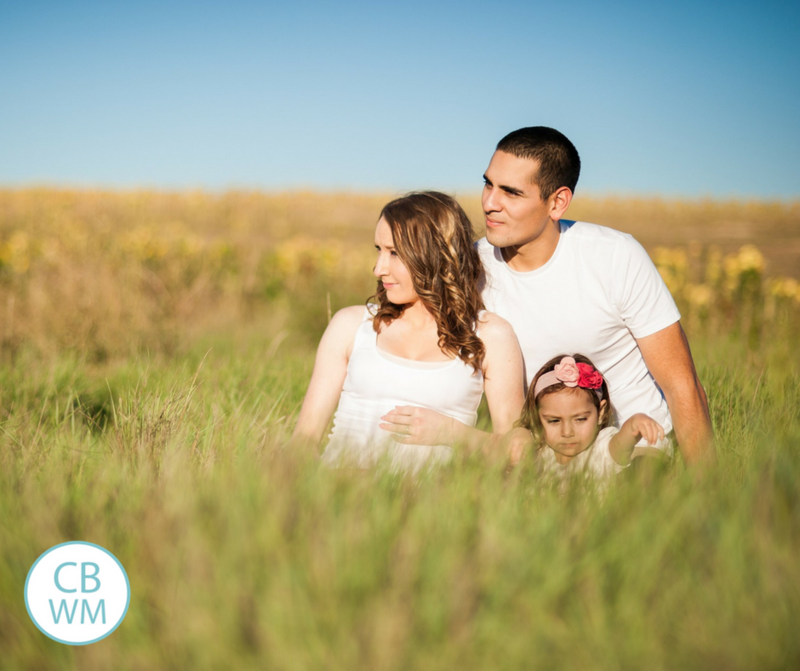 There are some couples, however, who find themselves with different parenting goals or different takes on Babywise and how to apply it to their children. 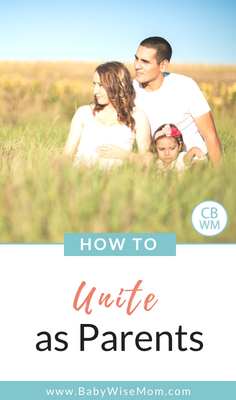 It is imperative that you are united in your parenting. Your child needs consistency from both parents. Both parents should read the books. You need to be on the same page (not literally; one can read faster than the other 😉 ). It will be a lot harder for your spouse to follow Babywise principles if he only knows what you have told him. Some dads have limited time. He can read slowly. Mom can also determine which sections are vital and dad can read those; those sections will often change over time. Discuss your methods and come to an agreement. You need to have the same goals and come to an agreement on how to implement those goals. Most dads are fine with “cry it out,” but there are some who are uncomfortable with it. You need to be in agreement of what to do and how to do it so you don’t confuse the child. This applies to infanthood as well as toddlerhood. If one parent insists upon vegetables being eaten before dessert and the other one doesn’t, you are sending mixed signals you your kids. If one parent is always getting baby out of bed instead of CIO while the other is sticking with CIO, it will only make the process harder on the baby. Don’t parent your spouse. If mom is around the kids all day, she is more than likely going to know the kids better. She is going to know what works and what doesn’t. Resist the urge to tell your spouse they are parenting incorrectly in front of your kids. Recently, my husband started to give “threats” that he would never carry out. For example, he would tell Brayden to either come or we would leave without him. Of course that would never happen and it wasn’t the right motivator. I had to point this out to my husband, but I did so after the kids were in bed. He hadn’t even realized what he was doing. Fill each other in. If you have instituted a punishment, make sure your spouse knows. Tell each other about improvements and difficulties. Keep each other informed. Correct mistakes as needed. For example, let’s say Brayden lost his Nintendo privileges for the day, but I haven’t told Daddy that yet. Daddy comes home and Brayden asks for Nintendo, and Daddy says okay. It is okay for me to come in and inform Daddy (and remind Brayden although he likely didn’t forget) about the loss of privilege. Brayden would then turn the Nintendo off. Back each other up. If I was out of the room and my husband told Bradyen he needed 5 more bites of pees, then Brayden tells me he is done and I say okay, I need to back up the 5 more bites decision once I find out about it. If one of you is unsure about either how to handle a situation or doesn’t agree with how a situation was handled, you can tell your child to wait while you talk about it. Respect roles. Like I said, the parent who is home with the kids all day is going to know the kids better (typically the mom). She is going to know the discipline methods that work and those that don’t. She is going to recognize the different cries of the baby sooner than the one who is working for most of the day. She brings experience and knowledge. The one works all day also brings a strength to the situation (typically the dad). He brings fresh eyes and fresh perspective. He can more easily step back and see the whole picture. He also often brings strength and some sanity. Accept the strengths of each other and use them to create a strong “parent team.” Work with each other to do the best for your kids. Communicate. Communicate your feelings and thoughts, and respect the feelings and thoughts of your spouse. As you unite and parents, you will only become stronger. You can utilize the strengths of each other to be the best parents you can be for your children. Thanks for that post! It is helpful and reassuring to me that I’m not the only mom who loses her level headed nature during those postpartum weeks. A nice reminder too about how to communicate effectively with my husband around the kids when parenting. What a wonderful post…I second all you wrote!I am a therapist & I have worked with many people who just needed information like you wrote! Thanks for the blog…it’s a great resource.